Incredibly delicious gluten-free white cheddar quinoa bites with hot and spicy buffalo sriracha sauce! The perfect appetizer or party food! Let's start with this sauce. This sauce has an incredible depth of flavor! I find it to be spicy, sweet, tangy and lusciously savory all at the same time. The best way to prepare this sauce is to make a double (or triple!) batch and store it in the fridge for use over a couple of weeks time. Now, these bites! These little things are one of those things that I could eat every single day if I had them readily available. Not only are they chock full of protein and incredibly filling, they are so amazingly delicious, and with or without sauce, they are so fun to eat (great for parties)! My toddler enjoys these without the sauce (too much spice for him! ), as they are easy to pick up with his little fingers and have that cheesy taste that kids love. Also, these scrumptious quinoa bites easily double as vegetarian meatballs with their heartiness and nutritional value--the possibilities are endless for your choosing a way to serve them! 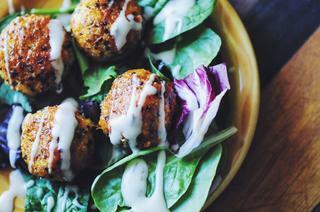 Great on their own, or as I like them--on a bed of greens drizzled with ranch dressing (! ), you will be incredibly happy that you gave these a try...I promise!! Hot & Spicy Buffalo Sriracha Sauce: Heat a saucepan over medium heat. Melt butter in saucepan, then whisk in all remaining ingredients. Bring to a low simmer while whisking continuously. Turn off heat right before boiling. Use immediately, or let cool completely before storing in a closed glass container in the fridge.White Cheddar Quinoa Bites: Preheat oven to 375°F. Line a cookie sheet with parchment paper & set aside. In a large mixing bowl, combine cooked quinoa, eggs, breadcrumbs, cheese, salt, garlic powder & paprika. Stir until evenly combined. Let mixture sit a few minutes. Using damp hands, take 1 rounded tablespoon of mixture at a time and shape into a ball. Repeat with remaining mixture. Place quinoa bites on your parchment lined cookie sheet. Bake for 15 minutes, using tongs to flip bites halfway through. Remove from oven & using a small spoon, top each bite with a generous portion of Buffalo Sriracha Sauce. Bake for 10 minutes more, flipping halfway through & topping off with any remaining sauce. Remove from oven when bites & sauce are just beginning to brown. Serve on their own, on a bed of greens, or with a side of ranch or blue cheese dressing! Enjoy!